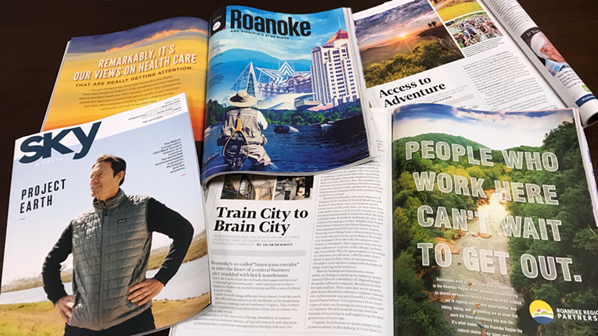 The Roanoke Region is flying high in Delta Sky magazine this month. The 24-page spread showcases some of the region’s successful businesses and people in the April publication. The in-flight entertainment magazine can be found in the seat-back pockets on Delta flights all month and has The Nature Conservancy CEO Mark Tercek on the cover. The profile features the best the Roanoke Region and the New River Valley have to offer in the realms of business and tourism. The magazine brings national attention to some of the great things we already know and love about this region. It’s Easy Being Green: Impressive livability, tech-forward industries and natural wonders around every corner. Who wouldn’t want to live and work in the Roanoke Region? Train City to Brain City: How Roanoke and the New River Valley have launched and sustained an industrious technology corridor. Fostering Great Minds: The higher ed institutions of Roanoke the New River Valley feed Southwest Virginia’s most innovative and important industries. Access to Adventure: No matter where you stay in Virginia’s Blue Ridge, pristine mountains, rivers, and trails are just minutes away. Star City: Roanoke’s farm-to-table food, robust wine and craft beer scenes, and excellent cultural offerings take center stage. The magazine has more than 5.4 million readers each month. The region was least featured by Delta Sky in 2014.